DAVAO CITY, Philippines (Mindanao Examiner / Apr. 14, 2011) – Unidentified gunmen shot dead a militant leader who heads a group of small scale miners in the southern Philippines, local human rights groups said Thursday. It said at least four gunmen were involved in Tuesday attack that killed Santos Manrique in the town of Pantukan in Compostela Valley province in Mindanao. “The blame for Ricky Manrique’s death falls squarely on the shoulder of President Aquino, who has not taken concrete steps to punish those responsible for extrajudicial killings in the ranks of the workers and other marginalized sectors,” said Emma Ricaforte, executive director of the Mindanao-based Nonoy Librado Development Foundation. Ricaforte’s group, which is backing workers’ rights and their welfare, condemned the killing and blamed Aquino’s inaction in resolving extrajudicial killings for the continuing atmosphere of impunity in the country. Last year when Aquino was elected president, the former senator said he will put a stop to extrajudicial killings which is widespread in the Philippines. Human rights groups have blamed most of the killings to the military and its militias. “Until we see proof that the number of deaths and other human rights violations are going down and that perpetrators are being punished, we will consider this administration’s proclamations cheap talk,” she said. Ricaforte expressed fear that Manrique would just be another unsolved death. She said that the mining leader was a great loss because he bravely opposed the operations of large-scale mining companies. “At the time of his death, he led the stand against the Nationwide Development Corporation and its partner, the United States-owned Russell Mining and Minerals, Inc.,” she said. She said they also feared that the organized workers are being targeted because they are the most vocal about demanding their rights and also because of their meager number. Ricaforte said a recent report by the Manila-based Center for Trade Union and Human Rights showed that only 237,000 or 12 percent of the country’s 19.5 million workforce are unionized. A human rights group called Karapatan in Southern Mindanao said Manrique was the president of the federation of miners in Pantukan town and also a member of the Anakpawis party list. It said Manrique was 44th victims of extrajudicial killings since Aquino took over from President Gloria Arroyo who had recorded at least 173 extrajudicial murders during her time from 2001 to 2010. “We are adamant that the Aquino administration is taking a different course from that of the Arroyo administration. With a total number of 44 victims under the Aquino administration in just 10 months, this means four to five victims of political killings a month,” said Hanimay Suazo, acting deputy secretary-general of Karapatan party list. She said the mining leader was the 6th victim of extrajudicial killings in southern Mindanao. “Five previous cases of political killings in the region are yet to be resolved, and now, another victim is added to the list. 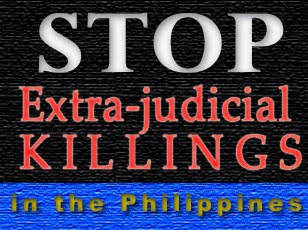 We can only conclude that the perpetrators of the political killings are on a killing spree,” Suazo said. “We believe that the deceptive Oplan (Operation Plan) Bayanihan, which parades itself as a counter-insurgency campaign that respects human rights is responsible for the killings. The census that the military is doing during their civil-military operations or the peace and development teams in the community gathers intelligence information on the members and leaders of progressive organizations and the information are then forwarded to their operatives,” she said, referring to the government’s anti-insurgency campaign where most of those reported killed in random attacks were political activists. “We demand the Aquino administration to abandon its counter-insurgency operation that is plainly similar to the previous Oplans which targets unarmed civilians,” she said.